Sunday night's Red Sox - Yankees game lasted 4 hours and 46 minutes. It ended at 12:53 a.m. Monday with a "Hacksaw" Mike Napoli homer in the 11th inning. Napoli hit 2 dingers and 4 RBIs and Boston took 2-out-of-3 from New York. 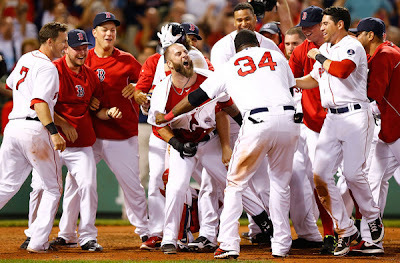 The Red Sox are 60-40 through their first 100 games, 1 1/2 games in front of the Tampa Bay Rays in the AL East.